Jan Bobrowski and Partners Ltd. The Scotiabank Saddledome is a sports arena in Calgary, Alberta. The arena opened on October 15, 1983, and is the current home to the Calgary Flames of the National Hockey League (NHL), Calgary Hitmen of the Western Hockey League (WHL) and Calgary Roughnecks of the National Lacrosse League (NLL). The arena was also known as the Olympic Saddledome from 1983 to 1996, the Canadian Airlines Saddledome from 1996 to 2000 and the Pengrowth Saddledome from 2000 to 2010. Scotiabank currently has naming rights on the arena. The arena has a seating capacity of 19,289 people. ↑ "Parking / Transportation". Scotiabank Saddledome. Retrieved 2014-10-24. ↑ "Olympic Saddledome". Archives Alberta. Retrieved 2014-10-24. ↑ "Sensational Saddledome helped define Calgary". Calgary Herald. Retrieved 2014-10-24. ↑ "The Saddledome: the Olympic ice stadium in Calgary". Canadian Journal of Civil Engineering. Retrieved 2014-10-24. ↑ "Construction Manager for Olympic Saddledome". Calgary Herald. Retrieved 2014-10-24. 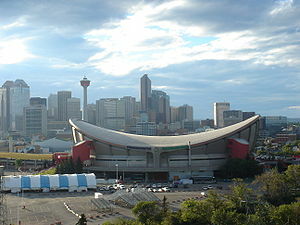 Wikimedia Commons has media related to Scotiabank Saddledome. This page was last changed on 28 October 2018, at 08:54.